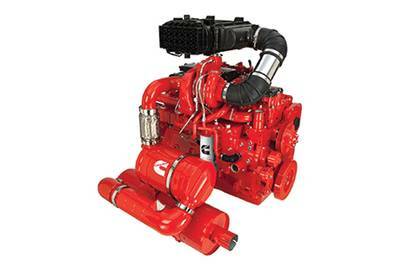 Cummins Power Generation launched two new diesel G-drive engines from 240-433 hp that are certified to meet EPA Tier 4 Final emissions regulations for nitrogen oxides (NOx) and particulate matter (PM or soot) without the use of a Diesel Particulate Filter (DPF). Instead, the new engines employ a combination of in-cylinder combustion improvements, exhaust gas recirculation (EGR) and selective catalytic reduction (SCR) exhaust after treatment. The new engines are suitable for powering generators from 150-300kVA. The first Tier 4 Final G-drive engines, available Q2 2014, will be the QSB7 and QSL9. The QSB7 is rated at either 240 or 315 hp and designed to power generator sets with standby ratings of 150-220 kVA. Available at the end of Q2 2014, the QSL9 will be rated at 433 hp and designed to power generator sets rated at 300kVA. “By eliminating the need for a DPF, these engines offer reduced maintenance and 4% better fuel efficiency than previous Tier 3 engines,” said George Iarca, regional manager for G-drive, Cummins Power Generation. The Tier 4 Final G-drive engine packages will also include diesel exhaust fluid (DEF) dosing and supply modules that control the dispensing of DEF into the SCR to cut emissions of NOx.